Want to Learn More About Brewing Coffee? The ritual of the pour over is like a meditation: There’s no machine in your way, no flashing green lights, no electric power cords. Just you and a few simple tools. The final cup is reminiscent of one from a drip coffeemaker, but noticeably more delicate and complex. Observe the bloom, experience the first trace of coffee-drunk steam, notice how the spiral of the pour alters the final cup. This simple experience gets you in tune with your coffee. Bring at least 600 grams (20 oz) of water to a boil. Grind 30 grams of coffee (3 tbsp) to a coarseness resembling sea salt. To enjoy the nuanced flavor of a single-origin coffee that is lightly roasted, we recommend less coffee: 23 grams for every 350 grams water. Place a filter in the dripper. 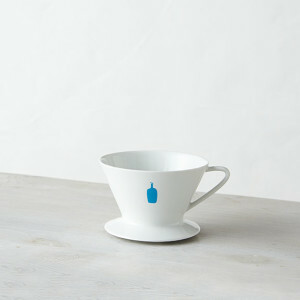 If you are using a custom Blue Bottle filter, there is no need to pre-wet it. If you are using a #2 filter with another dripper, we recommend wetting the filter with hot water and then dumping the water before proceeding with brewing. Add the ground coffee to the filter and gently tap it to level the surface of the grounds. 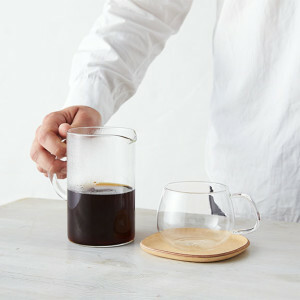 Place the brewer on a carafe or cup, place this entire set-up onto a digital scale, and set it to zero. There will be four pours total for this coffee preparation. This is the first, and the most magical, because it is when you will see the coffee “bloom.” As hot water first hits the grounds, Co2 is released creating a blossoming effect—the grounds will rise up en masse. Start a timer. Begin pouring water slowly over the coffee, starting at the outer rim and moving in a steady spiral toward the center of the grounds. Stop pouring when the scale reaches 60 grams. Make sure all the grounds are saturated, even if you need to add a little water. The pour should take about 15 seconds. Give the coffee an additional 30 seconds to drip before moving on to the second pour. Starting in the center of the grounds, pour in a steady spiral toward the outer edge and then back toward the center. Be sure to pour all the way out to the edge over the ripples in the filter. This helps to keep grounds from being trapped in there and removed from the rest of the extraction. Add roughly 90 grams, bringing the total to 150 grams. The goal during this pour is to sink all of the grounds on the surface of the bed. This creates a gentle turbulence that “stirs” the coffee, allowing water to more evenly extract the grounds. Allow 45–65 seconds to elapse. 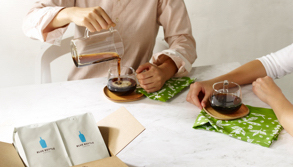 As the mixture of water and coffee from the second pour drops to the bottom of the filter, coming close to the level of the grounds, pour an additional 100 grams of water using the same pattern as the second pour. This brings the total up to 250 grams and should take 15–20 seconds. When the water and coffee from the third pour drops to the bottom of the filter, complete your fourth and final pour. Add 100 grams, bringing the total up to 350 grams of water. This pour should take 20 seconds. Enjoy a fine cup of coffee. Bring 1½ cups (350 g) of water to a boil. Place the dripper on a carafe or cup (whichever you would like to brew into) then place a filter in the dripper. 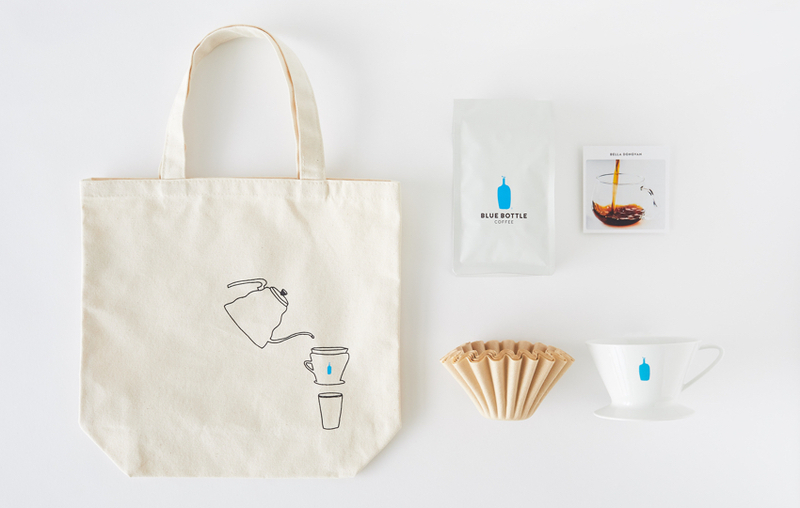 Empty contents of the Blue Bottle Perfectly Ground envelope into filter. Gently shake the dripper to level out the surface of the grounds. First pour, or the “bloom”: Pour about ¼ cup of hot water over the coffee, starting at the outer rim and moving inward in a steady spiral toward the center of the grounds. Make sure all of the grounds are saturated during your first pour. 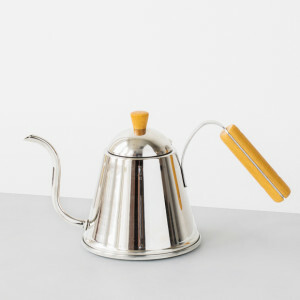 Pour remaining hot water over the coffee in roughly 2 to 3 equal parts, pausing between each pour to allow the coffee to drip and the waterline to drop about a thumb’s width (be careful not to dry out the grounds). Start in the center of the grounds, pouring at a medium flow rate, moving out to the edge and then back into the middle. The goal during this second pour is to sink all of the grounds on the surface of the bed. This creates a gentle turbulence that “stirs” the coffee, allowing water to more evenly extract the grounds.